Looking back over my slides from the early 90's (this is one converted from digital; disappointing, but you can still get an idea), a smile came over my face. I took this photograph on the day we shot the pilot for A Gardener's Diary on HGTV. In the upper right hand corner, you can see the tip of the front porch of Ruth Mitchell's house. 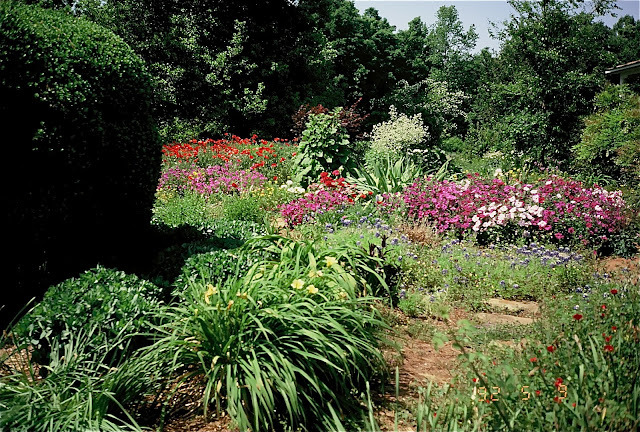 At the time, she and her husband Dennis were having a ball tending a giant cottage garden that covered several acres. I'd never seen so many flowers. Ruth was the first woman to obtain an agronomy degree from the University of Georgia. Her historic farmhouse was built on land that had been in her family since the 1840's. Ruth had moved away and lived most of her adult life in California. On a trip to Australia, she met her husband Dennis, who grew up in a coal mining region of England. 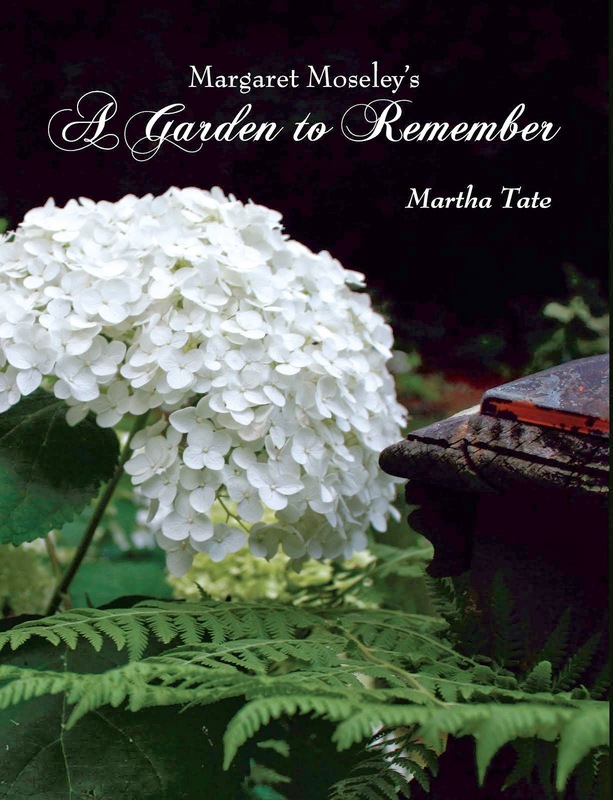 The two returned to Ruth's homestead in Georgia and for years planted flowers and vegetables and raised chickens. They flew both the American flag and the Union Jack from the side porch of their home. In this photograph, you can see but a portion of the enormous garden. The white, frothy plant in the center of the frame is Crambe cordifolia. To the left are Ruth's beloved red corn poppies, which she called Veteran's Day poppies. In the middle are reseeding petunias, which were everywhere and made you wish for the wonderful colors and variety of these old fashioned flowers. That spot of red to the left of the pink and rose colored petunias is a tiny patch of sweet williams, Dennis' favorite flowers. If you put in Ruth and Dennis Mitchell in the search box in the upper left hand corner of the blog, you will come to the post of June 21, 2011. The photo shows yet another view of the garden on a different side. The Mitchells grew thousands of poppies, which were interspersed with blue cornflowers. They also had hundreds of peonies in rows, and antique roses like 'Cecile Brunner', 'Perle d'Or' and 'Mutabilis'. Dennis, who loved growing vegetables, had his rows interspersed with colorful irises from Ruth's collections. There was dazzling color everywhere you looked. Twenty years have passed since the heyday of this garden. Dennis died years ago, and Ruth says her memory is not what it used to be. Looking at this picture reminds me of these two people, who were in their early 70's and mid-80's when I used to visit. They took advantage of every day to get out and enjoy what they loved to do. When I asked Ruth what she liked best about the garden that she and Dennis created, she said, "Oh my. I loved all of it. We just had so much fun." Fun, that's a fitting word for pure joy.